NICE, France – The night before last it was my arrival in Nice, in the south of France, for my only night in the town this year as I attend the Monaco Grand Prix. I’ve been lucky enough to luck out on an apartment stay in Monaco itself this year, so the rest of the week will be devoted to trying to crash the impossible town and find a place to play in Monaco. I have one or two ideas. But this post is about King’s Pub in Nice, in the old town. It’s a mainstay of live music in a town that is bursting at the seams with live music. But after a few years where it seemed to have lost its way with the open mic, the open mic is now back with a vengeance on Tuesday nights. As soon as I saw somewhere that King’s Pub was holding an open mic on Tuesday, I shelved all other plans and went directly there after a wonderful dinner at one of my favourite restaurants in Nice (had gambas pasta). I arrived after 10 PM and the open mic was just starting. I was delighted, because the crowd looked like your bona fide open mic crowd, and not just a jam crowd. And the MC, Chris, was announcing that the stage was open to anyone, and he’d just play a few songs first. The stage is very sweat, a nice comfortable size for a single musician, but they also manage to get whole bands up there; and the sound system was so good that you had perfect vocals and great guitar sounds coming out of every performer’s set. And there is also an excellent monitor, so you feel as comfortable as anything. I love this fabulously huge pub with giant high ceilings, and when you stand on the stage, you can look right down through the whole pub and out through the front entrance into the street. And you can project, and hope that you will attract more spectators or musicians. In any case, there were a number of musicians, but it was also free enough that I managed to do a long first set, and then later on, finished off with a second set. Another long one. It was pure delight from beginning to end. One of the nicest open mics I’ve done in Nice, now. Hoping things will continue this way in Monaco….! Quick Notes From Milan, Nice, Paris and Singapore…. SINGAPORE – Looking back to see what my last post on this blog was, I’m stunned to see it was about my trip to Belgium! 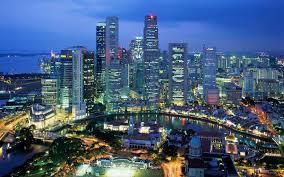 Since then I’ve been to Milan, Nice, Paris, and now I’m writing from Singapore. I’ve done an open mic in Nice, another in Paris, and I’m going out for music tonight in Singapore. I did a gig on Saturday night too, by the way, in Bondy, just outside Paris, in a neat restaurant called, L’Atelier. Time goes too quickly sometimes. But there really is a good reason for the lack of activity on the blog during that period. First performer at the Snug open mic. I’ve just emerged from my busiest period of the entire year in my job as a Formula One writer, having produced 16 full-length feature articles for the next two races, Singapore and Japan, which you will be able to find amongst my Brad Spurgeon stories on The New York Times site in the coming days; I have written a 5-page profile of the Ferrari racing boss, Maurizio Arrivabene, in the October issue of Road & Track magazine, which just came out on the newsstands yesterday, and I have also been preparing the visas, flights and hotels for the remaining part of my world travels, which will be hugely intensive over the next two and a half months, taking me around much of the world…. Fourth performer at the Snug open mic in Nice. So it is that occasionally, just occasionally, I can truthfully say that I’m not updating the blog because I’m a slacker who has run out of steam, but because it’s totally full-steam ahead in other areas, leaving no time for this. But now I’m back, and I’m hoping to keep this going massively in the coming months! Second performer at the Snug. 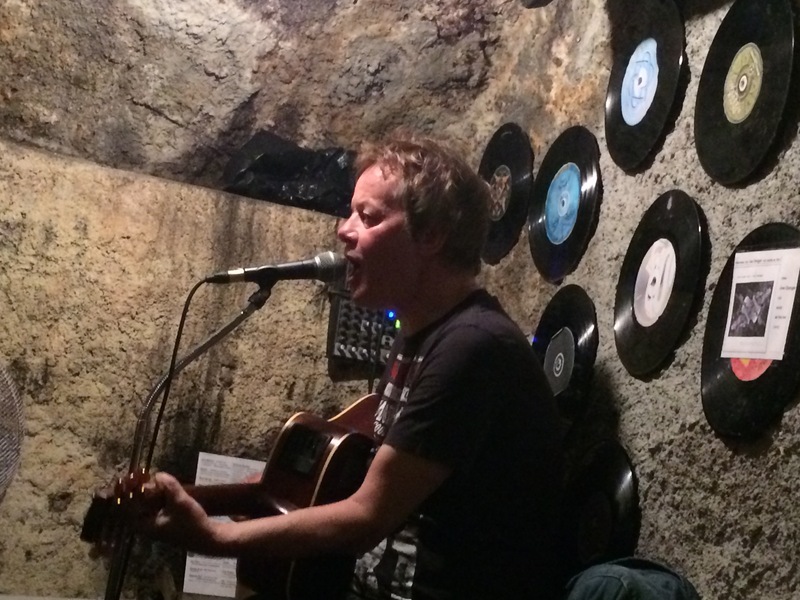 But first, I want to report that I finally got to play at the Monday night open mic in Nice at the Snug & Cellar pub. I’d been wanting to go to this for years, but I was never in Nice on a Monday night – until last week when I had to interview a legendary author – of one of the greatest car racing books ever written – and so I had a bit of time to check out the Snug. Third performer at the Snug. It was a pretty good atmosphere, full of people, full of musicians, a nice presentation by the MC, but the sound system was not the best on earth. And it tended to be a very vocal audience – during songs, I mean. Fifth performer at the Noctambules. In Milan, I think it was the first year ever that I did not get to play anywhere, as there too I had on the only night I usually play in a jam, I had an important interview to do for my job, so I had to let the music drop there. That was the first race at which I have not played at a venue in I have no idea how long, but it seems like years! First performer at the Noctambules. So it was that once back in Paris, it was with a vengeance that I went and played at Raphaëlle’s open mic at the Noctambules bar on the Place Pigalle – which I actually help organize a little too, making sure the sound is good for every performer…. It was another fabulous night, in any case, mostly because of Raphaëlle’s extraordinary MCing, and her incredible singing too, between the other wonderful musicians of the evening…. And that takes me to Singapore, where I am quite exhausted as I write these words and prepare to go out and force myself to keep awake, as the more than 20 hours of travel without any real sleep have begun to weigh on me…! PARIS – So my last night in Nice was not all that nice, really. 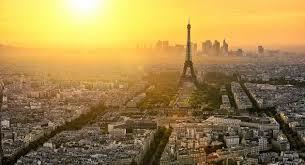 But things got better going back to Paris, and look even better soon…. On my last night in Nice, on Sunday, I went to the De Klomp bar, the open mic of which was supposed to be happening. I entered the bar and asked the waitress about the open mic, and she confirmed it was happening. But the stage was not setup and I had to wait for it to be set up. I ordered a beer, therefore, and waited. No open mic. No stage setup. So I then asked the guy who looked like the manager, and he confirmed there would be an open mic, and he went on to explain that they were changing the style of it, and that it was going from a bit of a jam thing amongst friends to a real open mic format and jam. He told me to wait until the band came to set up the state. But not long before midnight, I told him that it looked like the band was not coming to set up the stage, and he agreed. So I just finished my beer and left. Better luck next time! Monday was the trip back to Paris, reunions, fun, settling back into the winter weather of Paris (from the Cote d’Azur, that’s what it felt like.) And on Tuesday, it was a visit to the Baroc. The great Baroc. Unfortunately, I found that I had no juice in my iPhone and no battery power in my recording device, my Zoom, so I ended up with just one video. But it was a full, wild and crazy night at the Baroc. Wednesday, that’s last night, well, I went to check out a new venue, the recently re-opened “Aux Noctambules” bar on the Place Pigalle, and there I saw a band playing, and spoke to the owner about an invitation he had put out to Raphaëlle and I about playing there. 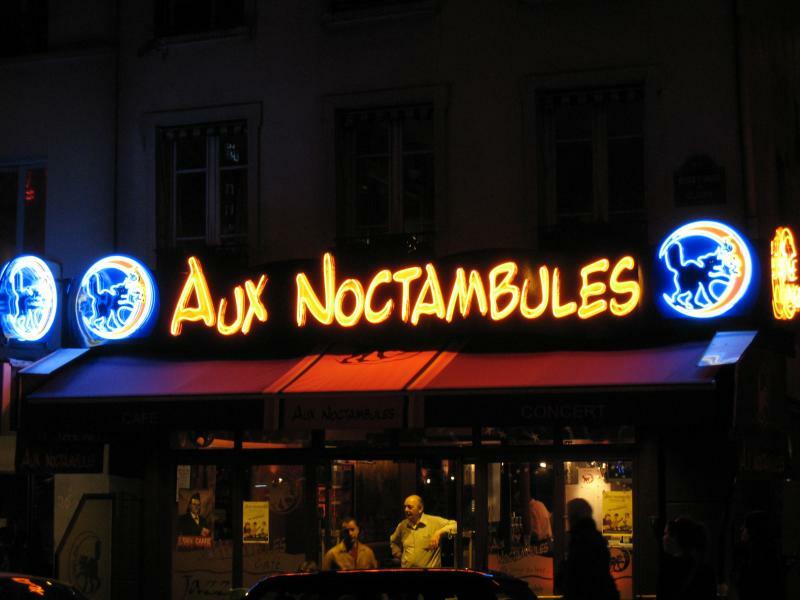 So that’s why we went and took a look, and indeed, it all looked really fabulous, so the result is that Raphaëlle Pessoa (along with Insu), will host the first open mic on Sunday aux Noctambules, on the place Pigalle! That’s the future taken care of! But what happened after that was that we went over to Trelys’s open mic at the Oasis 244 bar near the Jaures metro, and played some songs and had a really great laid-back time. Two of the high points for me of that open mic last night were definitely when Pascal segued into playing Bach on his harmonica (see the video until its end) and when another guy played AC/DC, “Highway to Hell” on his ukulele! I was out of battery power again for that on both sources, so only got a small bit. It was very funny – and later in the evening, he would play “Smoke on the Water” on the ukulele, which was also fun…. The Beat Goes on in Nice – or Does It? NICE, France – The question running through my mind over the last couple of nights as I have walked the streets of Nice, mostly the old town, is whether my imagination is playing havoc on my memory, or whether Nice had a brighter period for roaming musicians than at the moment? I passed many of the previous places I had played in here over the years to find either the businesses no longer existed, or there was a change of style, a change of owner, a different zeitgeist. Shapko still exists, but I saw nothing inviting in the way of the jam that was kind of slapped on to the end of a jazz night of band gigs. The King’s Pub told me they no longer host a jam or an open mic, and only show sports on TV. Johnny’s Wine Bar is long since gone. There are other examples of things past, but I’ll forget about them for the moment. There remains hope in places one would expect, though. I dropped in to Paddy’s pub to find a musician doing a nice little gig on the nice little stage, and warmly coming up afterwards to say hello, as I had a compliment to make of his music. I asked him about open mics and jams, and he only knew of one that I will try tonight – hoping it still exists. But his stage was not open, as it has been in the past during other gigs. That said, Paddy’s apparently has an open mic every Tuesday night, so that’s great news. From there, I decided to head on down to the first of the former Johnny’s venues, this one called Jonathan’s Live Music Pub. There, as soon as I saw that it was Friday night, and therefore one of the nights served by one of the three D’s – three musicians all having the letter D as their first initial somewhere – and I saw it was Joe Danger, I knew I was at least in for a fun moment of music. And as with years past, it was the same climate: Go into the bar before Joe is onstage and you’ll find it empty, or nearly empty of clients. Wait a bit, Joe Danger takes to his musical chair, and suddenly the whole cellar room of this great bar fills up with people, mostly young people, keen to go crazy with the music of Joe Danger as a backdrop. Joe, an Austrian originally, but who sings and speaks in perfect English, has been playing Jonathan’s pub for 15 years. He is really part of the walls, I think. Or at least the playing stool. He also has the great warm trait of offering the stage to people who ask, to play a song or two, although it is not an open mic. So he saw me with my guitar, we chatted, he remembered me from the past, and he invited me up to play. I high, high point of the week. Last night, I dropped by the Snug, where there is an open mic on Monday nights, and there was a singer. She played some lovely material, and after when I complimented her, we got to talking about my guitar. She normally plays an acoustic, loved my guitar, and I offered to let her use it on her next set. All over wonderful time – but I didn’t play anything. So there are bits and pieces of music and open stages still in Nice, but I still feel things have got a little reduced in recent years…. NICE, France – It’s funny how the atmosphere in music venues can change over time. In fact, the atmosphere for the clients of the Jam bar in Nice was the same last night as on the previous occasions I had come and played there. It was full of rocking, blues’n, soul’n music with neat sax and guitar and keyboard solos. It was wild and fast. And crowded. But if you are a new or unknown musician showing up at the Tuesday night open jam and open mic at the Jam in Nice, forget it. You won’t be treated equally to the regulars – at least that’s the way it felt last night. I had, as I said, played at the Jam in the past, and I had loved the feeling, the whole thin, and I believe I had been treated OK – although I do remember a long wait even in the past. But last night? It was one of those situations where you arrive and shake hands with someone at the edge of the stage who seems to be in charge, but he says he is not in charge and sends you to “the guy with the hat” behind the bar. The guy with the hat, moment he hears your English accent in otherwise excellent French, starts speaking to you in English – and puts you in the category: English tourist. Once in that category, I was doomed. It’s funny because in Paris I blend in with the cosmopolitain population; but here in Nice I never fail to feel like every local I speak to is fed up with meeting another “English tourist” and even when I carry out several exchanges in near perfect – but accented French – they still don’t believe I’ve lived most of my adult life in Paris and I am NOT a tourist in this country! So I buy the drink, and I go and sit at the front of the stage. And over the half hour I’m sitting there, I’m seeing one new musician after another enter the Jam bar and take to the stage – with guitars, with keyboards, for vocals, you name it. Saxophone, trumpet. Cajon. Just climbing up on the stage. And I’d already spoken before dinner to the drummer and bass player, and they saw me sitting at the table at the front of the stage with my guitar. So everyone knew that I was there to take part in the jam, but guess what? I was not a regular. The others were all known to each other. And boy was I right! I crossed town using my iPhone GPS and found Le Volume in a part of town where I never played before – facing the old town, but in the city center, on the opposite side of the tracks – and I found this stupendous place devoted to live music. My first thought was that it reminded me of the place I did the open mic in Barcelona a couple of weeks ago, because like Freedonia in Barcelona, Le Volume is an association. You have to buy a membership and leave your name and address. But don’t worry, the membership costs 2 euros and lasts a year! I entered the building to find, like at Freedonia, two different venues in one. But unlike Freedonia, where one stage was for comedy and the other for music, here at Le Volume, it’s all music. The rooms are on one side for an acoustic jam session, and on the other side for an electric jam session, complete with drums, electric bass, etc. The acoustic jam was in full swing when I arrived. As you’ll see from my videos, it was pretty free-form, but people were doing songs nevertheless, and anyone could join in, both the acoustic and electric areas. I felt complete acceptance by everyone – unlike at the Jam bar – and I joined in and did a few songs in the acoustic jam, on which I had people playing the cajon and bongos, and violin, and another guitar, and helping out on vocals too. It felt very much like the kind of scene I have found in places like in Budapest with its Szimpla Kert jam sessions; or even a real sort of hippie feel too it. The Volume also puts on concerts and the music faculty in the local university here is doing some demonstration soon of the fruits of its students’ work this year. So Le Volume is a really multi-purpose musical association, an just a great place to go and jam. OK, it’s not the night club feel of the Jam bar, but for me the important thing was feeling welcome! I’ll return! P.S. The jam session usually takes place on Wednesdays, but due to a concert overlap thing, they ran the jam session on Tuesday night this week. There is also a rap open mic on Friday….